I was at a memorial service when I saw a person that caused me to cringe. Feelings of resentment and bitterness filled my heart as I remembered and reflected upon the hurt that person had inflicted upon me in the past. It was at that very moment I realized I had a choice to make: I could either dwell and stew and baste in the bitterness of my soul (which is what I normally do!) or I could give God an opportunity to “sanctify” my life. I braced myself for the worst. After all, taking poison out of a human heart is no easy task. I expected that God would give me greater trials; a refining fire to purge out the bitterness and resentment. But at that very moment, I felt a tap on my shoulder. I opened my eyes and, very unexpectedly, I saw a dear Christian friend; someone I haven’t seen in over seven years! He smiled and winked at me. Then I realized that God answered my prayer rather immediately and miraculously. Timing was everything: if I had not just prayed that prayer, that simple interaction with my brother would have been just another pleasant reunion. But because I had just specifically given God the opportunity to work in my life, it was a HOLY moment! Unbeknownst to him, my dear friend was the conduit of God’s love being poured into me at full force – kind of like taking a drink from a fire hydrant! God’s love swept over me, filled me, and flushed the poison out of my heart. Wow! I was free to worship, I was free to minister, I was free to love… And yes, free even to love the one to whom I had once harbored so much bitterness. To rephrase an old 60’s song: “all we are saying is give Christ a chance.” We have a million chances a day to give the Lord an opportunity to direct our lives – but how often do we? Every choice we make without God is a choice that leads to emptiness, shallowness and in many respects, death. Every choice we give to Jesus is an opportunity for life, real life, lasting life, “huge” life. “In Him was life, and that life was the light of men” (John 1:4). It’s about time we started turning on that “light” switch more frequently … it leads to true life. What are some moments where you realized you needed to change? 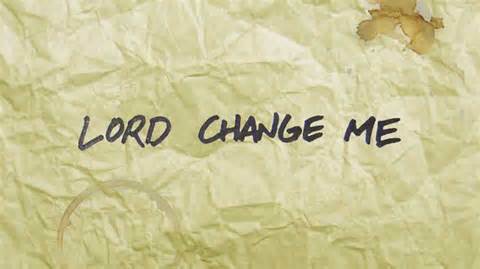 How does God bring about change/transformation in your life? I appreciate you being transparent and real with us Doug!! !